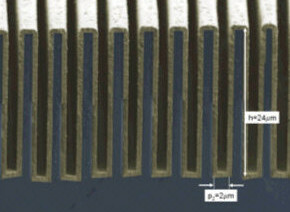 The microfabricated grating structures are the key optical components of a grating interferometer. The beam splitter grating and the analyzer grating are used to sense very small changes in the path of the x-rays caused by refraction on phase gradients in the sample. The gratings have periods in the micrometer range to enable high phase sensitivity in a compact experimental setup. High aspect ratio structures are required to provide sufficient contrast for hard X-rays. The grating area determines the field of view of the setup, and thus large area gratings of many square centimeters are required for some imaging applications. We fabricate large-area phase gratings using photolithography and deep etching into silicon . 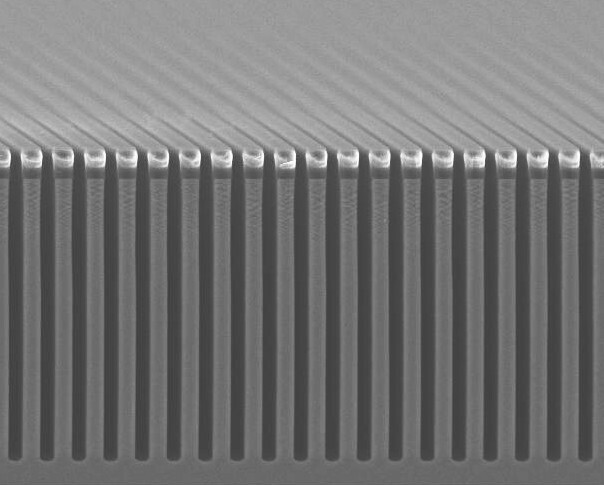 Both one-dimensional line gratings of high aspect ratio (Figure 1), as well as two-dimensional checkerboard patterned gratings (Figure 2) are fabricated using deep reactive ion etching . Absorbing analyzer gratings are manufactured based on silicon moulds. The silicon mould is fabricated using the same processes as for silicon phase gratings. 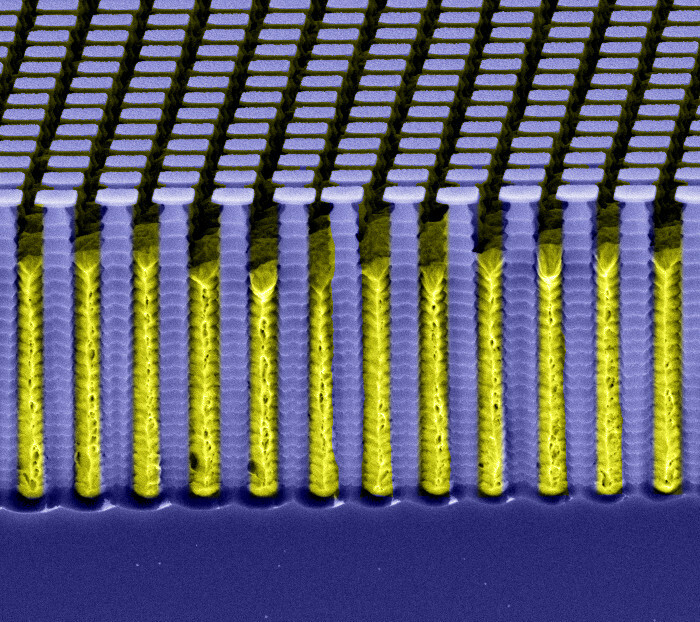 After evaporation of a seed layer, the silicon mould is either conformally covered with gold in order to create a frequency doubled grating of high aspect ratio (Figure 3) as described in more detail in  or it is filled from the bottom as shown for a two-dimensional mesh grating in Figure 4 and detailed in . 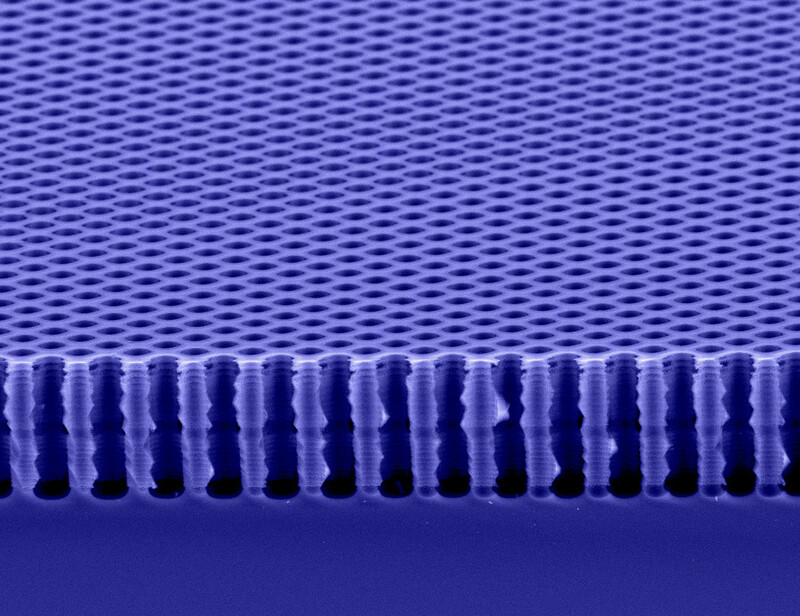 The challenge for high photon energies - which are of required for imaging of thick objects - is that extremely high aspect ratios are required for the absorption gratings, in order to obtain good contrast. As an alternative approach, we have developed a structured scintillator grating. This silicon grating, which is filled with scintillator material, replaces the combination of absorption grating and scintillator screen and can provide improved contrast and thereby improve on the signal to noise ratio .